DJzone DJ Magazine :: American DJ Duo Station Controller A 2-In-1 Hit! American DJ Duo Station Controller A 2-In-1 Hit! Looking for an easy, economical way to control both your RGB LED lights and the On/Off switching of conventional effects? American DJ has the perfect solution with its new Duo Station controller, a compact, affordable unit that’s actually two controllers in one. On one side of the Duo Station there’s a basic 3-channel RGB LED controller that allows users to select colors and chase speeds and control other basic functions on any standard RGB fixture. 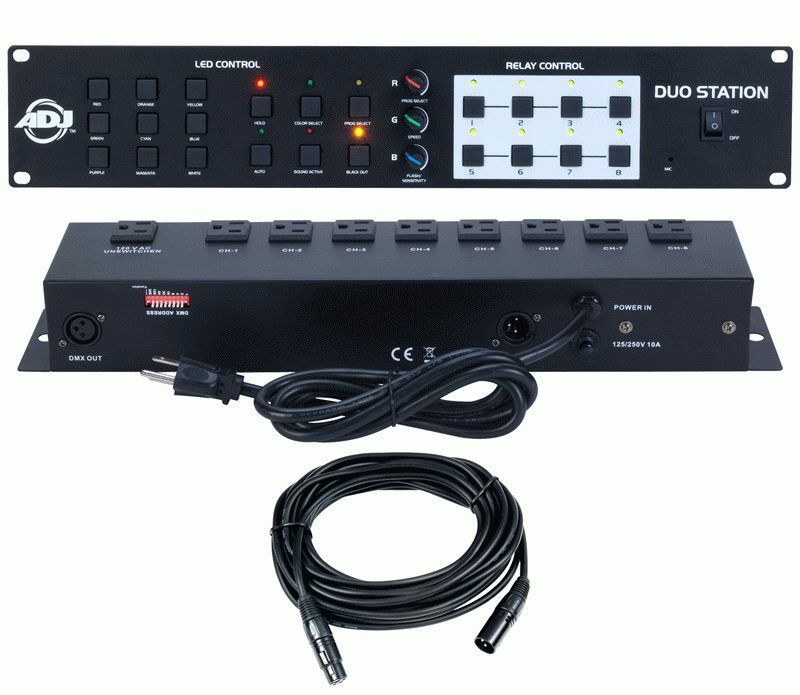 The other side of the Duo Station features an 8-channel Relay On/Off Switching system for activating and de-activating conventional effects, similar to American DJ’s best-selling SC8 controller. Both the RGB LED controller and Relay On/Off controller have their own separate outputs on the rear panel, allowing each side to run independently of the other. In addition to the controller itself, the Duo Station system includes a Relay Pack and a 20’/7M DMX cable to connect it to the control unit. The “LED side” of the Duo Station will work with any standard RGB fixture, where Channel 1 is Red, Channel 2 is Green, and Channel 3 is Blue. It includes 16 built-in chase programs as well as 9 static color scenes. Operators can create their own LED light shows and displays with easy-to-use controls such as a Color Select Button, Hold Color Button and Program Select Button. Additionally, there are 3 Manual RGB Potentiometers that allow you dial up a desired color on the fly. The LED controller can also be run in Sound Active Mode, as well as in Auto Mode, in which the 16 chase programs will randomly sequence at a selectable speed. The “Relay Switching side” of the Duo Station features 8 buttons for switching channels On and Off. Included with the system is a Relay Pack that can accommodate both DMX and Stand-Alone operation modes. The Relay Pack includes 3-pin XLR DMX input/output connectors, as well as dipswitches for DMX addressing and work mode setting. In addition to serving the 2-in-1 control needs of today’s DJs, bands and clubs, the Duo Station was designed to meet “real world” demands for lighting gear that is compact, lightweight and affordable. The controller itself measures 19” x 3.5” x 3.5”/ 483 x 89 x 89mm (2 rack spaces), and weighs just 3.5 lbs./1.5 kg. The Relay Pack measures 18.75” x 3.5” x 2.5”/ 473 x 89 x 63mm, and weighs 5 lbs./2.25 kg. The MSRP of the Duo Station system, including the Control Unit, Relay Pack and 20’/7M DMX Cable, is just $209.95.